These robust TRV’s are primarily designed for offshore use. The compact size and weight allows it to be economically transported and deployed. 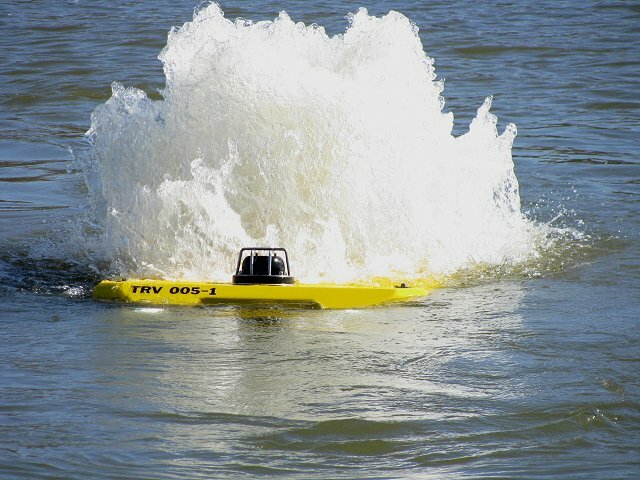 The TRV class is large enough to provide a stable platform for video and sonar surveys offshore and with most ancillary 3rd party data acquisition. The TRV excels where productivity, reliability, ultra-high thrust, and minimal down time is essential to a project’s success. The TRV Series has an open, angular frame made of T6061 marine grade aluminum which allows superior through flow for better hydrodynamics. The rugged frame is designed to take abuse and allows secure mounting of any auxiliary equipment. Finally, the aluminum frame contributes significantly to the mass required for stability. The thruster configuration on the TRV-005 (Port, Starboard, Lateral and 2 x Verticals) allows for a 6 kt. Forward, 3 kt. Lateral and 4 kt. Aft capability. In addition, the TRV-005 rotates 120 degrees per second and provides the above performance figures at only 45% power. This is designed into the TRV-005 whereby the desired performance is achieved without running the system at close to maximum power, thus providing greater reliability on all components. – The TRV-M performance allows 4 kt fwd, 3kt aft and 2kt lateral and is more than capable of operating in most conditions. – TRV-HD being the largest vehicle currently operated by SSI allows a comfortable 3kt fwd, 2kt aft and 1.5 lateral performance. In an attempt to minimize downtime, the TRV systems have a totally modular design. This allows minimum expertise to maintain the TRV systems, keeping the vehicles in a fully operational condition. Where the TRV Systems differ from all other ROV’s is that should a fault occur, the suspect TRV module is simply exchanged with the relevant Spare module returning the TRV into 100% operational condition without opening any housings and minimizing de-bugging efforts. The suspect Module is then returned to SSI for repair / testing. From convenient, easy to remove connectors, oil filled cables and simplicity in removing the foam block for complete access, the TRV systems are designed for the true offshore environment. TRV-005 and TRV-M have the ultimate in vehicle maneuverability with ability to proceed Fore, Aft, Rotate, Lateral, Vertical (normal mode), Vertical (pitch mode). The TRV-HD performs as a workhorse should, very stable in all 3 axis of movement. To maximize pilot control, TRV systems have 0 to 100% Variable Thruster Gain on 2 circuits (Horizontals and Verticals). Forward Trim is also standard. Pitch and Roll Annotation in degrees, automatically displayed when selecting Pitch Mode. Ag/Ag/Chl Proximity Probe including CP Annotation with 1mv accuracy. Recovery strobe with pressure switch. TRV’s come standard with an MS 1000 Sonar or comparable model as per client’s request. Modified 4-function HD manipulator with 1″ Rope Cutter, all fittings changed to Swagelok including the Stainless Steel braided hoses. When stowed, the Manipulator is completely protected from accidental impact and does not interfere with Camera viewing. Modified Dual 4-function HD Manipulators with 1″ Rope cutters, all fittings changed to Swagelok including the Stainless Steel braided hoses. When stowed the Manipulators are completely protected from accidental impact and do not interfere with Camera viewing. Modified Dual 5-function HD Manipulators with 1″ Rope cutters, all fitting changed to Swagelok including the Stainless Steel braided hoses. When stowed the Manipulators are completely protected from accidental impact and do not interfere with Camera viewing. All TRV’s come standard with 4 Cameras: 1 x Color Camera with Zoom, Focus, Pan & Tilt, 1 x low-light Black & White with Pan & Tilt, 1 x 70 degree Color Manipulator camera and 1 x 50 degrees Color camera with 360 degree rotate. All TRV’s come standard with 3 spare penetrators to allow for additional functions as they become necessary. All TRV’s come standard with Five LED lights on 2 circuits with 0 – 100% variable gain. TRV’s allow up to 3300’ excursions in live boat mode. Deeper options are available with side entry cage. TRV’s comes standard with a spare 1500’ terminated tether. Other tether lengths are available as per client’s request. TRV’s come standard with 10 pages of user annotation including Heading, Depth, Altitude, Turns Counter, C.P., Pitch, Roll. TRV’s come standard with a remote joystick which is selected by the Pilot for launch and recovery assistance.